One morning in 1926, a boy named Alexander Gregory was hurrying to school when he came upon rail tracks near the tiny Gaithersburg railway station. The station superintendent on duty was Alexander Dunn. Dunn asked the boy to wait, and so he did. A light snow was falling as a slow train passed them. After the last carriage went past, the boy started to cross the tracks and then he froze. Dunn shouted at the boy to warn him as an express train bore down on him from the parallel tracks on the other side. Then, taking matters into his own hands, Dunn, who was 62 years old, flung himself at the boy to separate him from the tracks. He was too late. Witness report that the impact threw the Alexanders into a ditch dozens of feet away, and killed them both instantly. 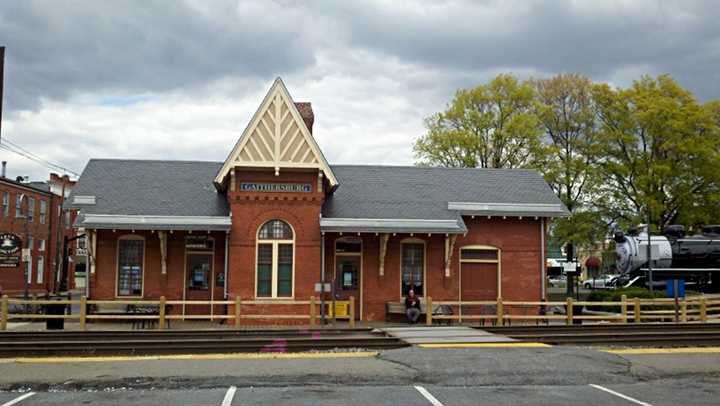 For the last three days, I have been eating my lunch at the Gaithersburg railway station. It is still the same little building of red brick, except that very few trains pass. Now and then, an Amtrak train roars past without stopping, or a long goods train ambles in a slow and tired way. On my morning and evening walks, I haven’t seen a train stop here yet. Perhaps, Olde Town Gaithersburg is not really one of the hot spots en route to Washington DC. It gives the impression of a town past its heyday. There are immigrant workers from South America, either doing tough jobs or waiting beside some of the TexMex restaurants and old specialty stores which might have been quaint at one time. The old town rubs its antiquated shoulders against the economy of the Beltway – that ribbon of asphalt is quite close, with exits to countless office suites where men and women work for government agencies. Inside the station is what appears to be a functioning Amtrak ticket dispenser. There are a few wooden tables and the place is very clean. Some paper flowers adorn the walls, and there is a time table of bus routes. There is only one other room, in which two Asian women run a cafeteria with a predictable and disappointing name: Java Junction. The ladies don’t talk much but they make very good sandwiches. Their servings are small, unlike the huge Virginia-style portions that they serve at the hotel in which I am lodging. I have half a mind to ask these ladies whether they have bought the station premises and whether the ticket dispenser is just a showpiece, like the steam engine from the museum next door. But I find it hard to communicate with them; they are not exactly loquacious. They are also quite short and most of the counter is half a foot taller than either of them; they remain invisible busybodies who surface with sandwiches, take your money and retreat behind the glass. So, like the two afternoons before this one, I take my sandwich and go to the empty room with the paper flowers and the Amtrak machine. There is a clean, but now defunct ticket window. In front of the window’s railing, are some black-and-white photographs and newspaper clippings from 1926. One of them carries the title, “Two Alexanders Perish”. The other describes how Dunn posthumously received the Carnegie Medal of honor for trying to save the little boy. I read this article again, just like I have for the last two days. Some details commit effortlessly to memory, like the light snowfall on the morning of the accident. I think of the snowfall, and imagine the train rumbling through the flakes. I think of Mike Daisy’s fabrications about Foxconn factories in China, and wonder whether the snowfall had really occurred. It is calm inside the empty room. Well lit and not at all gloomy. I replay the story of the two Alexanders for the third day in a row. But, I don’t think about the grizzly details of the accident, or the families of the dead. I feel exhaustion sweeping over me slowly and recall the never-ending commitments at work in recent weeks. For three months I have been counting the days until these deadlines go away and leave me alone. Without complaint, I mentally tick off the checklist of fear, worry, petulance, expectation and sadness that have accompanied these ten workweeks from hell: Each project, each paper, each program, each collaboration, each deliverable has been its own self-sufficient bedeviler. I note how it has been impossible to make anyone else understand this. I think of the classic loneliness of our time, where each person is truly an island, and no one really understands him. We listen to one another and think to ourselves, “I know how that feels”. Sometimes, we really do want to know how that feels. But mostly we can’t. We don’t know people’s private demons because most people do not or cannot share their private demons. Every person is unhappy in his or her own unique way. Why this story of an improbable tragedy calmly brings me face to face with an existential crisis, I cannot say. I allow myself the admission – exceedingly rare for the optimist I imagine myself to be – that work and life may not all turn out well, that arbitrary and terrible things could happen at any time and that the most one can wish for is to have some equilibrium between tragedies. Strangely, the out-of-control negativity of this does not alarm or depress or worry me as it would normally have done. I step out into the cold, but there is still no sign of the airport shuttle that was supposed to pick me up. I look for telltale signs of the ditch where the old man and the boy must have fallen. I don’t find them. On the other side of the building, a steam engine looms in repainted black and silver, like a dragon meticulously groomed in a coat of new mail, but dead without its flaming breath. I become interested in the ridiculously large brakes and dampeners on the wheels. Behind it, a metal carriage from the old Baltimore and Ohio railroad briefly catches some sunrays. In the carriage windows are reflected vistas of tree branches with spring-green leaves and a cloudy sky on the other side of the railway tracks. Their incongruous beauty intrudes on my emptiness a little, and I stop to take a picture or two. Then I haul my bags and walk away. Wonderful post. And what a story too, definitely one to make a person contemplative.